I designed this nursery for our first child. My room inspiration always begins with color. 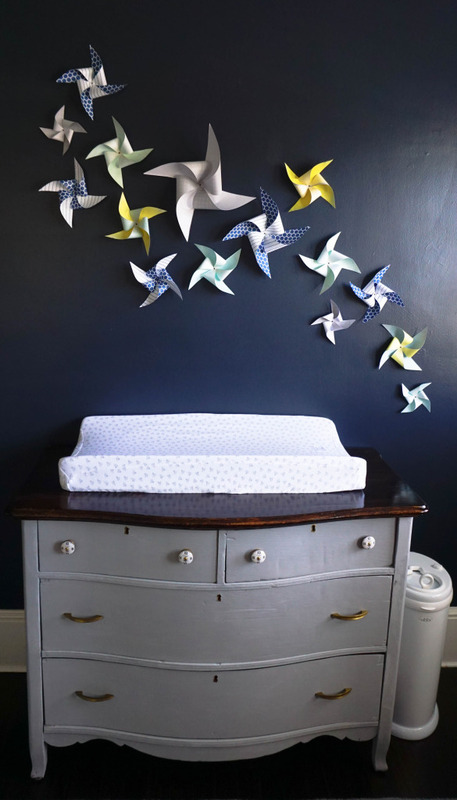 When I found out that I was having a boy, I immediately changed my plans for the two small spare bedrooms in our home - one was then functioning as our office and was painted a deep navy blue; the other was our guest room, a soft green. I'd planned to turn the guest room into the nursery and leave the office alone, but I couldn't stop picturing the moody navy walls paired with crisp white and dreamy grey in a little boy's room: the perfect backdrop for bright pops of color. I chose the repeating accents (bugs and books) because my husband's nickname for me is "Bug," and we're both English teachers, writers, and literature lovers, so we knew our little guy would have an extensive library before he was even born! I'm drawn to the aesthetic of midcentury modern furniture and I like to combine those simple, clean lines with bold patterns, layered textures, and bright colors. Whenever I can, I try to add personally meaningful pieces that lend history and character to a room. Gallery walls are my go-to solution for wall decor because they allow me to fit so much more art into my small house! Bug Prints: Rifle Paper Co. It's so hard to choose! I'm torn between the cuckoo clock (which belonged to my dear grandmother and enchanted me as a child) and the beautiful dresser that my husband (a furniture restoration novice) lovingly and painstakingly refinished this summer, starting over three times until it was perfect for me and the baby! I can be kind of obsessive when it comes to this stuff, but I really enjoy searching and searching until I find exactly what I'm looking for. If you don't settle for less, in any detail, no matter how small, then the end result has no chance of falling short of your vision. Be choosy with everything you bring into the room. That's my biggest challenge. I had tons of ideas and inspiration that I ultimately had to abandon because I just didn't have the physical space for everything that was in my head. I wanted the room to be vibrant and fun and full of character, but I didn't want it to look overly busy or cluttered. In a small room, that can be a very fine line, and you have to be willing to edit as you go. Lovely! Where did you get the crochet baseball? I love that red Ottomon with the navy walls. Where did you get it? We loved the pinwheels. How did you get them on the wall? Did you use push pins to put them together? What kind of paper did you use? Expecting our first baby boy, 11/11/14.